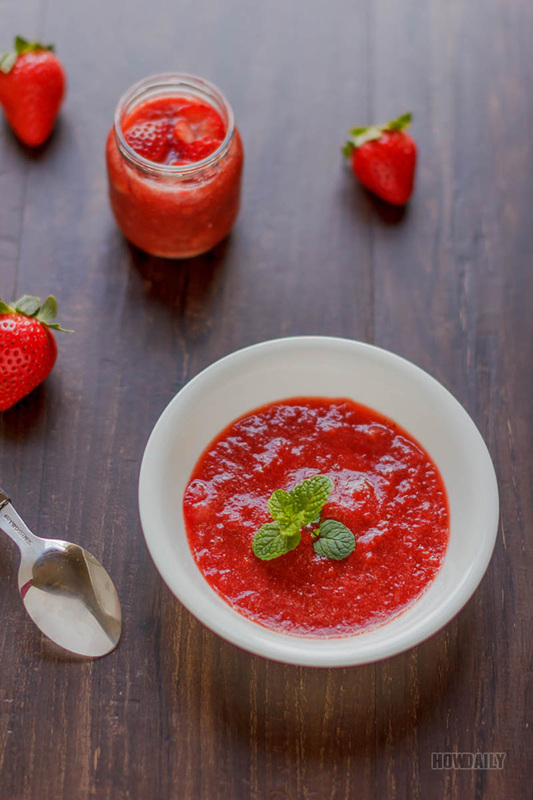 I love baking, and there’s one of my favorite topping/filling: strawberry compote. When we were moving into our house a couple years ago, my husband planted a strawberry root right on the very far corner of our backyard, the type that you grow and forget, you know. The year after, and the next up until now, that very strawberry plant has develop into a large enough batch that cover the whole ground, flowing over all of the flower bed next to it. So after a quick vote, we removed all the flower and yes, leave that very corner to strawberries, cause my son love them, well who wouldn’t? Thus since, we have fresh strawberries every season. My son loves to pick them, then washes and eats all by himself. But we just have too much, I mean you can’t just eat strawberries everyday, can you? Oop maybe you could. Any how, we just left with so many ripe strawberries that I decide to simply turn them into compote, and thus storing in fridge for near future baking and/or breakfast. It’s very easy to make, just 15 minutes cook time and the result is just delicious and beautifully red fir for all topping/filling. Plus, they taste so much better than the canned or store bought, and I can control the sweetness level in them. Oh, and you can add any juice in to tang them up, it doesn’t matter. As a matter of fact, the strawberries already have some juice in themselves. I just choose apple cider cause that’s what I usually have on hand and it already have some sweetness in their, so no added sugar for me. 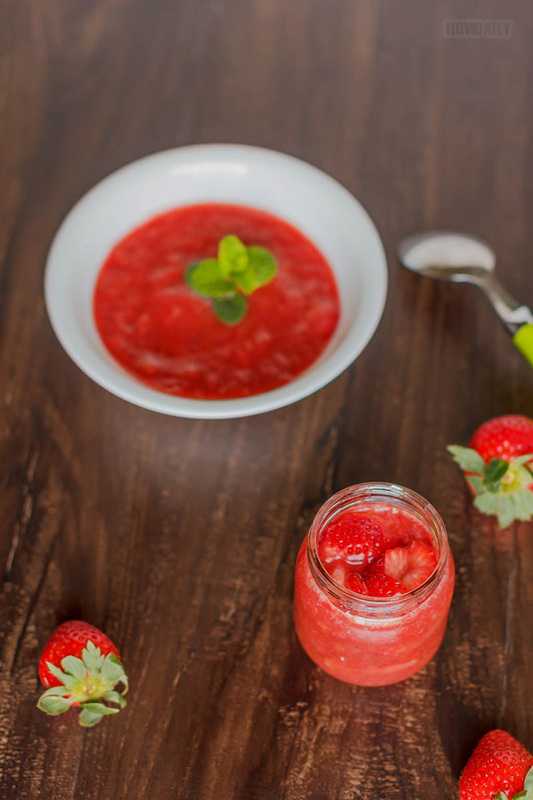 A sweet and easy to do strawberries compote that can top over any kind of desserts from ice cream, sundae, oatmeal, pan cakes, cheese to any bake filling. Wash the strawberries clean, remove stems, and kinda rub to remove all dirt. In your blender, add half of the strawberries and 1/2 cup Apple cider. Blend. 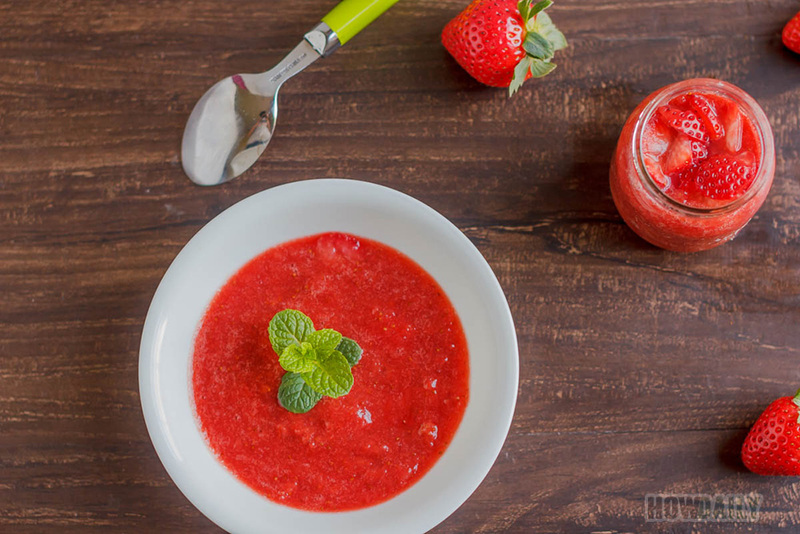 In medium heat, cook all the chunk and puree strawberries for about 15 minutes, stirring in between. 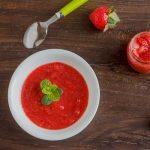 When the sauce is thicken enough, add 1 tsp sugar or not, depend on your strawberries and sweetness desired level. Stir and remove from heat. Let cool at room temperature and transfer to jar. Store in fridge and top on whatever you like. I just recently discovered strawberry compote. It’s perfect on my morning oats. Your recipe looks delicious, I didn’t think about adding apple cider, what a wonderful idea!